Sony Venom movie is back in the works. Re: Sony Venom movie is back in the works. Tom Hardy is a fantastic actor but have never liked Venom as a character. I'm hoping this is a case like Logan in that the actor elevates the movie but seeing that it's Sony, I won't hold my breath. New trailer. Optimism creeping in. I know next to nothing about Venom, but I enjoyed the trailer anyways. Since Sony took away his chest logo, they should’ve compensated with googly eyes. As far as the critics go, it is at 27% at Rotten Tomatoes which is really bad. This is a huge blow to Sony Studios who were really banking on this to launch an extended universe of Spider-Man-related movies. The number of people who are both Gaga fans and Venom fans is probably approximately zero, so the Gaga fans whole campaign is pretty much for naught. We need a Venom/"Bad Romance" mashup pronto! We were disappointed by this movie, although its trailers accurately set our expectations. Unfortunately they don’t substitute anything compelling for comic book fidelity. been an engaging Jekyll & Hyde spin suffused with dark comedy. Then the main plot returns & it feels perfunctory. The movie is tracking to have the biggest October opening ever so it isn't realy a flop. It is estimated to be heading towards an $80 million opening which is more than X-Men Apocalypse and approaching what Dr. Strange did. It remains to be seen if it has legs after word-of-mouth gets around but it will be curious to see if this is enough for Sony to continue with any of its plans. This was a perfectly adequate movie, and I'll watch the sequel. It was fine. I liked the relationship between Eddie and Venom. Legion: I will circle around you until the stars die an the world has forgotten what makes us different, and I will shatter any future that dares to divide us. 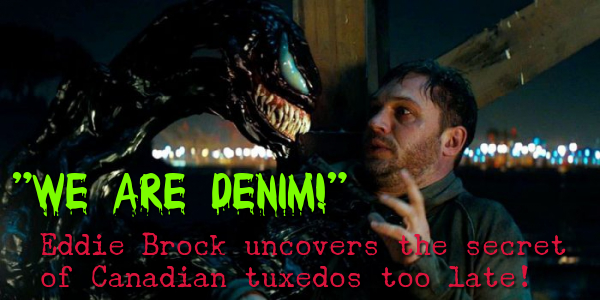 Yeh I really don't like Venom as a character very much, but I thought this was fun and watchable. Nothing special but way better than I thought it would be. Yay low expectations! If you bought a ticket to an advance scene from Spider-Man: Into The Spider-Verse, they threw in a free Venom movie! Lol, that's one way to look at it. This movie just keeps making money, now having surpassed Wonder Woman. How frustrating must it be to be Warner, have the entirety of DC Comics at your disposal, and over here we got Sony who decides they are just going to make Spider-Man movies without Spider-Man in them--and they do better than you do?! Audience goodwill is a helluva thing. That latest Spidey flick was a good one and WW came after two crapjobs. I'd definitely resigned this to the catch on Blu-Ray pile, but the numbers it's doing considering it's been on the whole panned by critics. Is there a little of "how bad is it really?" for the audience's, or is there just fantastic amounts of goodwill towards the Venom character? The marketing in China is super weird but apparently it worked. Tentacle boyfriends are a thing. Was there the usual cameo of a Chinese performer with a load of scenes that don't even make the DVD bonus list gig?